These ultra‐rigid, single slot grids are made of special Beryllium‐Copper alloy. Thickness 100µm (0.1mm), diameter 3.05mm. They offer excellent stability for coating with support film. The standard 2 x 1mm oval slot grids are contamination free and re‐usable after cleaning. A notch is stamped on one side of the grid to allow easier handling with tweezers. NUM grids: Numbered grids are in random order. Numbers may be duplicated. DOT grids: 2 dots are marked on one side of the grid for identification. Dots are visible to the naked eye. NOTCH grids: A mark, stamped on one side of the grid to facilitate the handling of the grids. Notch is available with NUM or DOT grids. GILDED grids: completely Gold‐Plated grids, suitable for immunology research, autoradiography, as well as special needs. Ask for other types available. Supplied in a box, usually from stock, on 150, 200 and 300 mesh copper or gold grids. We have introduced a third film type and renamed the second one, giving a more accurate description. Catalogue numbers for the first two remain unchanged. Formvar film, suffix F: A thin film of pure Formvar resin, 30 - 75nm. Formvar with carbon coating, suffix C, ~5nm: This film has a moderately thin layer of carbon which stabilises the films quickly under an electron beam. The most universally used support film grids. Formvar with heavy carbon coating, suffix CH, 15-25nm: This film is particularly strong and stable. The Formvar may be dissolved - see user note. This film provides greatest stability and strength. For highest magnifications of particulate matter these substrated grids, with the Formvar removed, show very little intrinsic structure. Note: All of our film is laid on the shiny side of the grid. Holding a grid with tweezers reflecting a light makes the film visible – if needed use low power stereoscope. There is a marginal advantage in inserting the specimen side down into the TEM. The condensed beam is then passed through the specimen last, avoiding image distortion due to the support film. Of course the support will affect the image in other ways, e.g. lowering contrast. A thin film of pure Formvar resin, 30 - 75nm. 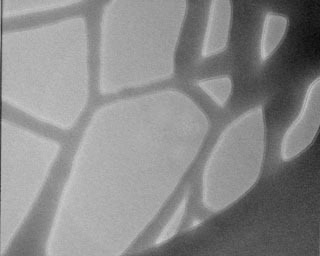 A thin layer, ~1nm of carbon on ~10nm of Formvar. The most universally used support film grids. A heavy layer of carbon, 15-25nm. This film is particularly strong and stable. The Formvar may be dissolved - see user note for Heavy carbon on Formvar. This film provides greatest stability and strength. For highest magnifications of particulate matter these substrated grids, with the Formvar removed show very little intrinsic structure. A lacey network support film. The holes in the lacey support film vary in size from less than a quarter micron to more than 10 microns making them ideal for any type of specimen. Lacey support films are extremely strong and withstand vigorous specimen preparation treatment. The specimen material is supported by the film network but lies across or protrudes into the holes of the mesh. This allows high definition imaging without the effects of underlying support material. Lacey films can be used for specimens ranging from large crystals and other particulate material to virus particles. Smaller particles, such as viruses or bacteria, tend to adhere around the inner edges of the holes, an ideal situation for high resolution microscopy. 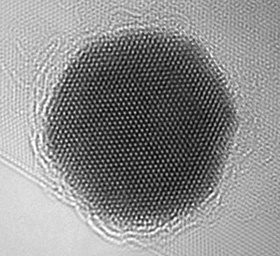 Lacey films are also ideal for selected area electron diffraction imaging. 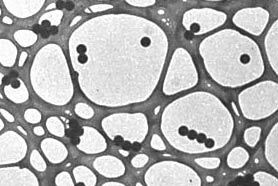 Large irregular holes in a Formvar film stabilised with carbon. These provide excellent support for sections and for large particulate matter. These are for observation of areas suspended over the open and therefore without diminished contrast or resolution. Films with small round holes as may be used for stigmating, are with TEM/SEM standards on page S2. 0.26µm dia. Latex on Ultrathin Carbon Film on a Holey Carbon Support Film, example of application. Ultrathin Carbon Film on a Holey Carbon Support Film: Pure carbon support films with no Formvar backing. This new product has an even thinner carbon film which is mounted on a holey carbon film. The carbon support layer lying over the holes is less than 3nm in thickness and is the thinnest support film available. It is particularly useful for high resolution microscopy of low contrast particles and is also ideal for use with the Energy Filtering TEM. Strong - LUXFilm™ is about 5x stronger than formvar. The films are compatible with a variety of common stains and ethanol based solutions (not for use with ammonium molybdate stains). Large unobstructed viewing area - LUXFilm™ TEM supports enable imaging of the entire specimen without interference from grid bars. Flat - The films are stretched on a copper or nickel supporting frame, exhibiting superior flatness. Used for particle counting or screening applications, meniscus effects are eliminated: particles spread more evenly and do not collect next to grid bars. Excellent beam stability - The films exhibit very little drift or charging effects in the TEM compared with formvar/carbon. Suitable for electron beam energies from 80 - 300kV. Wettability - LUXFilm™ has a favorably inherent surface energy, when glow discharge treated, for epoxy-embedded sections. Serial ribbons lay down flat and tend to "stick" to the film. Surface treatment can be performed to prepare the supports for negative stains and acrylic-embedded specimens. No autofluorescence - LUXFilm™ supports exhibit no autofluorescence and no unspecific labeling with antibody stains. This will make the films an ideal choice for correlative microscopy and immunocytochemistry in the EM. The large viewing area will assure that all labeled features are visible. Hydrophobic and hydrophilic silicon nitride membrane surfaces. These coatings are available on 50nm silicon nitride membrane with a window size of 0.5 x 0.5mm on a 200µm silicon frame with a diameter of 3mm, compatible with all standard TEM grid holders. Please ask if you have a requirement for these special support films. Graphene is a single atomic layer of carbon atoms, tightly packed in a two-dimensional honeycomb lattice. This novel material is atomically thin, chemically inert, consists of light atoms and possesses a highly ordered structure. Graphene is electrically and thermally conductive and is the strongest material ever measured. 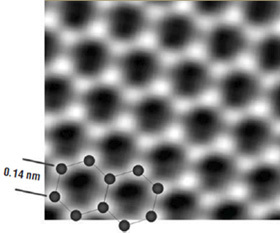 These remarkable properties make graphene the ideal support film for electron microscopy. Elemental analysis by FT-IR reveals that the synthesised graphene sheets are free of detrimental oxygen functionalities. The FT-IR spectrum of synthesised graphene is similar to that of highly oriented pyrolytic graphite (HOPG). 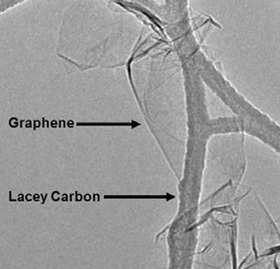 The ultrahigh-quality graphene produced by the substrate-free gas-phase method has enabled the unsurpassed TEM imaging of organic molecules and the interfaces between soft and hard nanomaterials. The pure and highly-ordered sheets were used as a near-invisible support film to directly image the atoms in a gold nanoparticle and its surrounding citrate coating. The results showed that the synthesised graphene can be used to directly observe nanoparticles functionalised with a diverse range of molecular coatings, such as proteins and DNA.